By D. C. Coile, Ph.D. 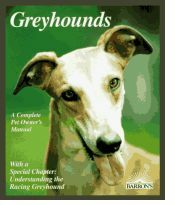 Although I am a long time greyhound owner, even I learned several things from reading this book. For instance, in dealing with the dreaded injury to the end of the tail, there is a pressure point on the underside of the tail near its base. Also, although I have long suspected it, one of the stated “predispositions” affecting greyhounds is osteosarcoma. Additionally, I may have even found the real reason a greyhound died following a routine neutering operation some years back when a tube placed down his throat ruptured something causing massive bleeding. Apparently, some dogs may have a collapsed trachea and in these dogs, the rings of the trachea are not formed correctly and the upper part of the trachea may collapse inward during heavy breathing.